Officially a month long today, the (partial) US government shutdown that began on Dec. 22 is now the longest in US history, surpassing both the 1995-96 shutdown (21 days) and 2013 shutdown (16 days), and with both Trump and the Democrats digging in, it shows no signs of ending any time soon. Indeed, Trump's latest proposal over the weekend to offer extended protections for "Dreamers" in exchange for border wall funding was rejected by Democratic leaders as a non-starter, suggesting both sides remain far apart. And with some analysts speculating whether instead of days or weeks, the current shutdown may last 2, 3 or even more months, pundits are starting to be increasingly concerned about its direct impact to GDP. According to BofA economists the impact to US growth from the partial government shutdown will be -0.1% for every two weeks the shutdown drags on, and as a result they have trimmed their 4Q GDP by 0.1 (to 2.8%), while their Q1 estimate of 2.2% will likely be downgraded similar to what JPMorgan did last week. In addition to the direct drag, indirect impacts are likely: furloughed workers may slow consumption and businesses could delay capex spending due to uncertainty. Companies who are suppliers to government contractors are also impacted, and SBA lending to small businesses/entrepreneurs has also been halted. Additionally, the delayed release and/or distortion of certain economic data creates more uncertainty for markets. Still, according to what high frequency economic data continues to be reported, there has yet to be a major hit to the economy, suggesting the stalemate will continue until the economic pain - for either side - becomes unbearable. 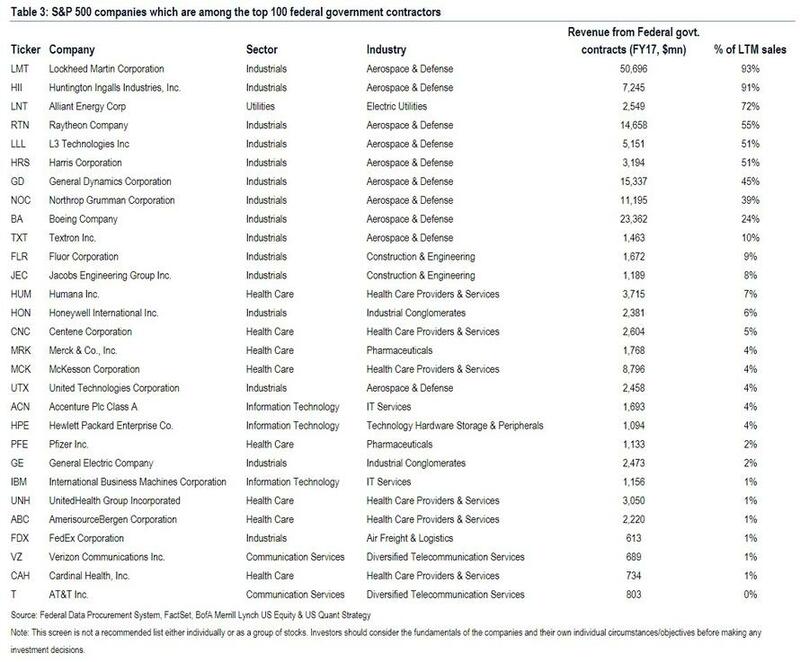 One place where the shutdown has certainly not had an impact is the market. 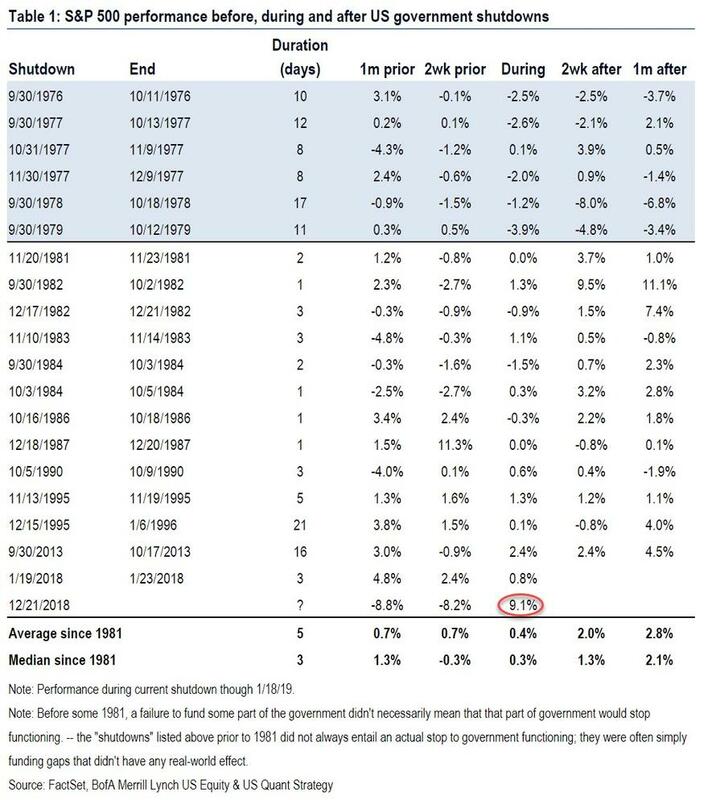 Historically stocks have shrugged off shutdowns (median S&P 500 return of +0.3% during government shutdowns since 1981), and has been up following the shutdown (median return of +2.1% the month after); the longest shutdown prior to now was 1995-96 (21 days), followed by 2013 (16 days). During these two longer shutdowns (where the rest since 1981 were five days or less), the market was flat during the 1995-96 shutdown, +2% during the 2013 shutdown, and +4-5% in the month after both. And even though we're now off the grid, and risks to both the US economy and the market are rising the longer the current shutdown drags on, one wouldn't know it by looking at the S&P's performance in the past month, when starting on the day after the shutdown, through today, the S&P is up a whopping 11%. 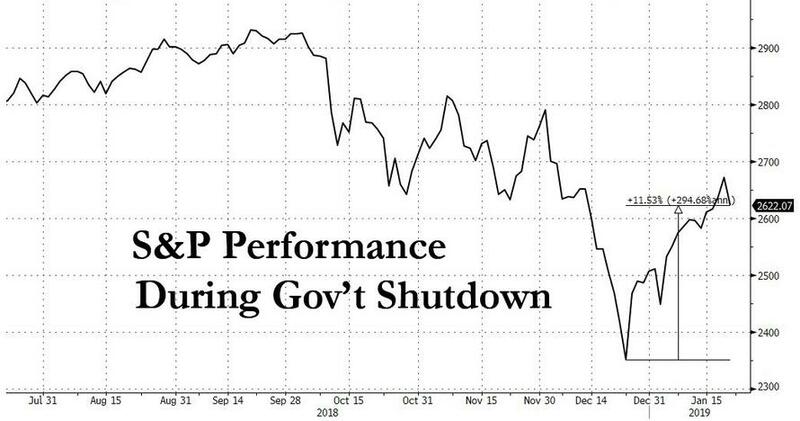 This is the best market performance during a government shutdown in history, outperforming the average shutdown performance over 20x. In other words, this may be the longest government shutdown ever, but for the market it's also the best... ever. Unfortunately for president Trump, who finds delight in a rising stock market, the outperformance during the last month may finally be rolling over, and as BofA Rates & FX Strategist David Woo notes, the impasse is a prelude to a potentially bigger fight over the debt ceiling later this year, where in his view, the US could be at risk of default this summer if the Trump administration and the Democrats cannot cooperate. (Spoiler alert: they won't).